Elvis’ funeral service was officiated by Rev Bradley. Attending the funeral were, Priscilla, Lisa Marie, Vernon and Minnie Mae Presley, Chet Atkins, Caroline Kennedy (who represented Rolling Stone Magazine) Ann-Margret with her husband Roger Smith, Col Tom Parker, James Brown, Charlie Hodges George Hamilton, Ginger Alden, Linda Thompson, Sammy Davis Jr.
August 16, 1977 was a day that, much like the day that President Kennedy was assassinated, everyone remembers where they were and what they were doing when they first heard the news – Elvis Presley‘s funeral two days later became a media circus. With thousands of fans arriving in Memphis to pay their respects to the King at Elvis’ Graceland. 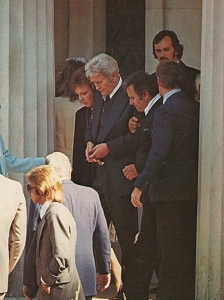 August 17, 1977 At 3pm the doors of the Graceland mansion were opened for the public viewing of Elvis Presley. The mourners ranged from pre-teens to middle-aged and older men and women. The crowd outside the Graceland Gates was estimated to be hundred thousand despite the stifling heat. The line of mourners file past Elvis’ coffin until 6.30pm when it was decided the heat and humidity would take its toll on Elvis’ body. 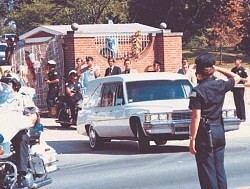 August 18, 1977 Elvis funeral service at Graceland was followed by a ceremony and burial. A motorcade of 14 white Cadillacs with Elvis hearse lined the streets from Graceland to Forrest Hill Cemetery. Jackie Kahane gave the eulogy . Jake Hess and the Statesmen sang “Known Only to Him” James Blackwood and the Stamps sang, “How Great Thou Art” and gave a melodious rendition of “Sweet, Sweet Spirit” an “His Hand in Mine” Bill Baise of the Stamps sang “When It’s My Turn” and Kathy Westmoreland sang a tearful “Heavenly Father”. The pallbearers at Elvis’ funeral were, Jerry Schilling Joe Esposito, George Klein, Lamar Fike Billy Smith, Gene Smith, Dr. Nichopoulous, “Son, Daddy will be with you soon. Daddy will be with you soon,” cried Vernon Presley. Two years later 26 June 1979 Vernon Presley died of a broken heart. 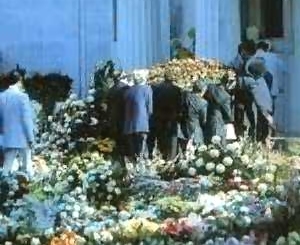 Elvis was laid to rest in a mausoleum alongside his mother Gladys. Under heavy guard, a simple reverent ceremony was conducted. At the time of his death Graceland was valued at $500.000. President Jimmy Carter’s message to the nation was; “With Elvis Presley a part of our country died as well.” Others said that the American Dream died with Elvis. There is no doubt that with Elvis’ death rock n roll music died and the world would never be the same again.